I’m a big fan of simple games. I know some gamers pride themselves on being able to play the most complicated and intricate games there are – and don’t get me wrong, I love those too – but sometimes I just want a game to be quick and easy to learn and play. I call these my “weekday games” or “zone-out games” or “I’m going to have a glass of wine with this game, games.” After a long hard day of working, the last thing I want to do is struggle with a game that’s going to use the same parts of my brain that have turned to mush and therefore further mush-ify them. No, I want to play a game that helps me relax. Generally speaking, though, I also like to play games with a wide variety of people, including those who aren’t big game players. Getting less experienced players into a game that takes five minutes to explain is going to make for a much better night than trying desperately to jam thirty minutes of rules into the brains of people whose eyes glaze over as soon as they see how many pieces there are. It’s important to make sure everyone’s having fun, and simple games are sometimes the best way to achieve that. Machi Koro was given to me by some friends for my birthday earlier this year. I don’t think it’s a game I normally would have picked up on my own, given its ultra-capitalism theme, so I was intrigued to give something I wouldn’t normally indulge a whirl. What I found was a game that was mostly fun, and definitely simple. In Machi Koro, a card game for 2 – 4 people, every player is somehow the newly elected mayor of the city of Machi Koro, and everyone is competing with each other to satisfy the citizens’ demands of building cheese factories, amusement parks, stadiums, wheat fields, apple orchards, mines, and more. It’s not clear how it works that every player is the newly elected mayor – but that doesn’t really matter for Machi Koro. Aside from the great art on the cards, the game doesn’t care about the story whatsoever. (Which is a bit of a bummer for a game as cute and silly as this one – I find that even having light story elements can spruce up any game, especially for those who aren’t super into games in the first place). 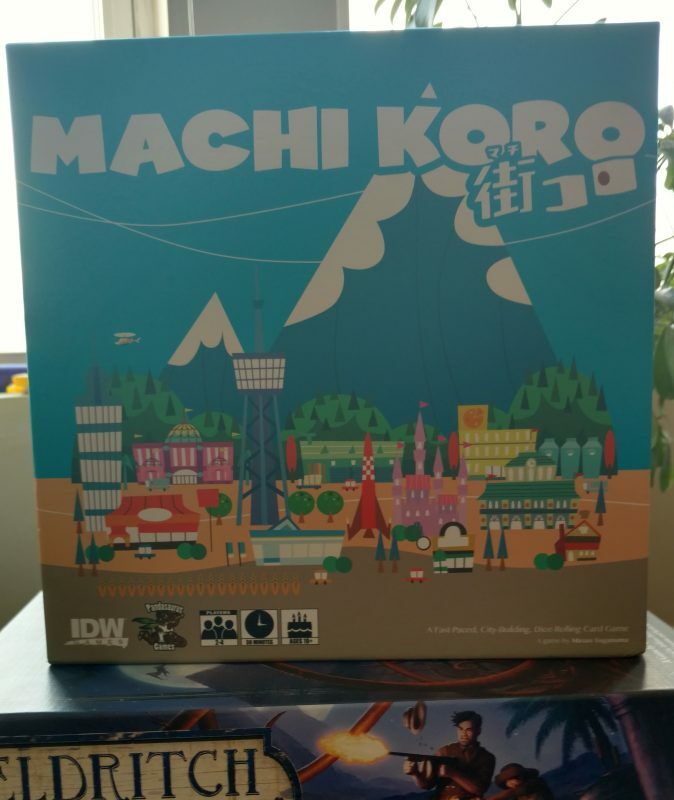 The goal of Machi Koro is to be the first player to build four special structures: a train station, shopping mall, amusement park, and radio tower. The structures with the bulldozers still need to be built! On your turn, you roll one or two dice. 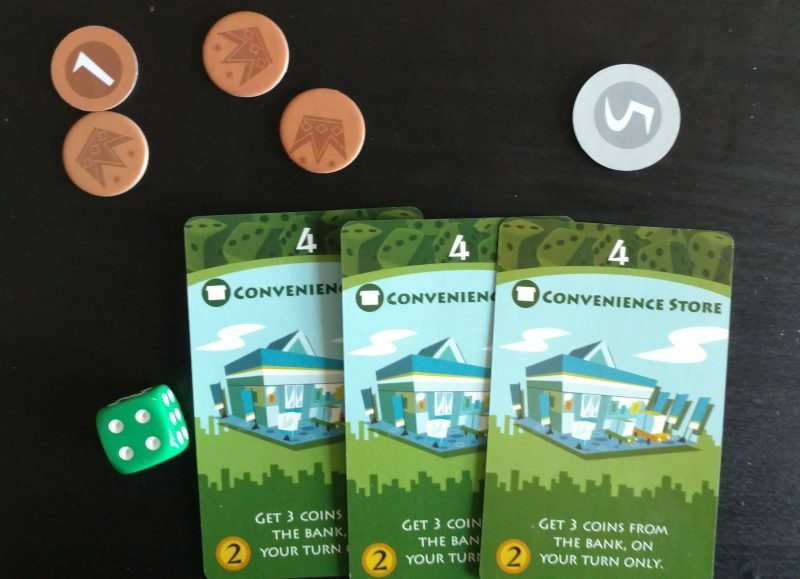 If the sum total of your roll is equal to the number on a building with a green border that you own, you collect coins equal to what the building tells you to collect. If the total is equal to a building that another player owns with a red border, you owe them what’s listed on the building. If the total is equal to a building with a blue border, everyone who has the building with the corresponding number collects income, even on your turn. And buildings with purple borders let you take something from other players on your turn. The number at the top of the card indicates what dice roll triggers its effect, the number in the bottom left hand corner indicates how much it costs to build, and the text indicates the card’s effect. So while I’m not passionate about the theme of Machi Koro, I can’t deny that it’s a fun little game that’s easy to pick up in a few minutes and also explain quickly to less experienced game-players. And probably the most complicated factor of the game – the order that the buildings’ effects are triggered once you roll a corresponding number – is pretty easy to grasp after a few turns. There are around twenty kinds of buildings/structures, and each one has a slightly different effect, so when you’re staring at all of them for the first time, it can be pretty hard to pick up what each building does. And because you have to have all the cards laid out across the table, which takes up a lot of space, there’s definitely a good deal of standing up and leaning across the table to read the fine print on each building. All but one time I played the game, the first player who built their third special structure was also the player who built their fourth special structure – and therefore the winner. That means it can be pretty difficult to come back from behind. That’s probably the danger of many simple games. Once you get the point of the game, you really get the point. And while I’ve played a bunch of two player rounds of Machi Koro, I’ve only played one four player round. There was a noticeable difference in the quality of the game that time. The four player round was definitely a lot more fun, with more variance and strategy – as there were a lot more players to compete against and the number of buildings available to each person was considerably reduced. It brought out new aspects to the game that I enjoyed. And in fact, one of the other players went out and bought Machi Koro for themself right after we finished hanging out. That’s another core feature of simple games – the ability to easily engage a number of people at once, given the quick rounds and gameplay, and the fact that your brain doesn’t feel like mush afterwords. The very last thing I’ll say is that even though Machi Koro has a very capitalism-based theme, there was an interesting lesson about extraction-based economics to be had. In the aforementioned four player game, I focused my strategy on primarily buying red and purple buildings – the ones that allowed me to take money from other players – rather than the buildings that earned coins based on their own production. For a while, I was sitting high, because when players earned coins, there was a good chance that I was going to be taking it from them. But then something interesting happened: I kept spending all the money people were making, building up my financial empire, and then . . . no one had money left to give me. There were several turns where people couldn’t do much because of that, and no one had anything left in their reserve. So even if someone rolled in my favor, I wasn’t able to collect. So I fell behind in buying buildings. Soon, people’s production out paced my extraction. And then there were a few more rolls that didn’t go in my favor. Ultimately, I lost because I was so dominant, but my dominance depended on taking people’s money and then transferring it outside of the system by spending it on more extraction-based buildings of my own. That meant players stopped having any coins to give me. Which meant I stopped getting coins at all. When the inevitable crash came from such a ridiculous economic model, the other players – who could produce on their own, without relying on someone else – were in a much better place to recover than I was. So by the time I learned my lesson about extraction, it was too late. Take note, capitalism. Okay, so maybe that’s a bit of a simplification of things, but, hey, it’s a simple game. Subscribe to our mailing list for news on our games and other people’s games!